Tau Pi Phi, honors outstanding students in majors in the Business & Economics department. Requirements are 15 hours in courses taught in the Business & Economics department with a 3.2 GPA, plus a 3.2 overall GPA with a minimum of 60 overall hours completed. Initiation ceremonies are generally held once each semester. Students who meet the above criteria should contact the Business & Economics Department secretary in the Department Office (Thomas 122) early in the semester to be considered for initiation to Tau Pi Phi. 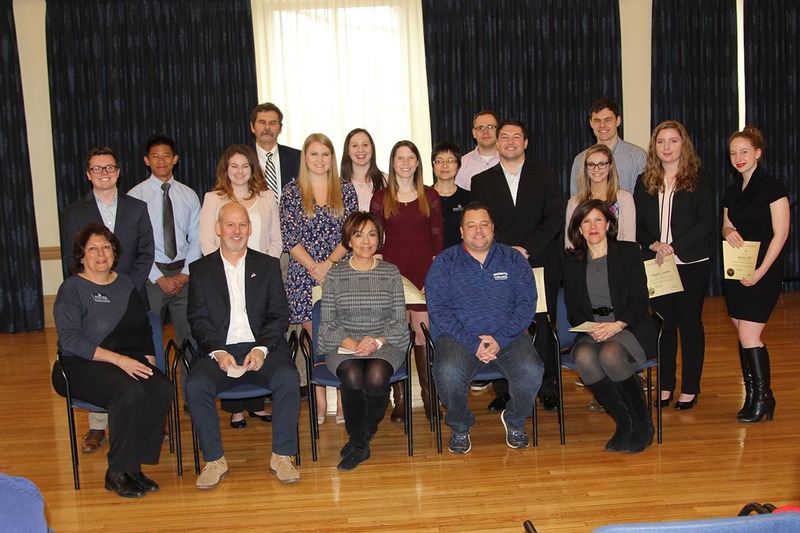 One of the highlights of Tau Pi Phi membership is the opportunity to collaborate with other Marietta College Tau Pi Phi members on one of two teams invited to participate in the annual national Tau Pi Phi case study competition. Tau Pi Phi was founded in Springfield, Ohio at Wittenberg University in 1931. The first two members of the honorary society were Wittenberg faculty members Professor Virgil H. Dassel and Dr. Daniel T. Krauss. In 1936, when Professor Dassel accepted a faculty position at Capital University in Columbus, Ohio, the Beta Chapter was formed. Since its founding, a number of chapters have been established in a variety of states from New Jersey to California. Tau Pi Phi encourages the establishment of new chapters across the nation. Initiation ceremonies are held in the spring of each academic year. Students who meet the above criteria will be notified by the B&E Department for initiation. At its March 21, 2018, meeting, the membership elected new officers for the 2018-2019 academic year. They are Taylor Pennock (president), Shannon Haessly (secretary), and Alec Shook (treasurer). Tau Pi Phi officers are responsible for organizing the annual initiation ceremony. Additionally, the Tau Pi Phi president is a voting member of the Department of Business & Economics. Each year all Tau Pi Phi chapters are invited to assemble teams of students to compete in the annual case Competition. Students gather for two days, usually in late March or early April, for the opportunity to analyze and present their recommendations on two business cases. The weekend concludes on Saturday afternoon with a banquet honoring the case winners and celebrating the work of all teams. For more information on the competition, please contact Tau Pi Phi advisor Professor John Fazio.